The man with the plan, Ezra Bridger. Before Rey, Finn, and Poe came to a galaxy far, far, away, a TV show on a kids network had already started to define the new era of Star Wars. That show, Star Wars Rebels, ended its four-season run tonight with a three-episode special that not only concluded the story that began way back in 2014, but offered a peek of the future, too. To truly appreciate what Monday’s episodes, A Fool’s Hope, Family Reunion, and Farewell, did, we have to start at the very end. So here’s your final spoiler warning. In order to liberate his home planet of Lothal, Ezra Bridger—the young Jedi in training at the center of Rebels—did something drastic. After a long and hard-fought battle, the whole thing came down to a choice: Let the people of Lothal die or give himself up to the Empire. Ezra chose the latter, surrendering to Grand Admiral Thrawn; however, when it became evident Thrawn had no interest in keeping his side of the bargain, Ezra’s backup plan went into effect. He summoned his space whale friends, the Purrgil, to destroy the Imperial blockade, incapacitate Thrawn, and speed off into oblivion. In the end, Ezra and Thrawn were gone, but Lothal and Ezra’s friends were safe. The show then fast-forwarded to the end of Return of the Jedi. Yes, there was a time jump—Rebels straight-up skipped over Rogue One, A New Hope, The Empire Strikes Back, and Return of the Jedi—to after the Battle of Endor, where the Rebels destroyed the second Death Star as well as Emperor Palpatine. We learn Sabine has remained on Lothal, keeping watch over the planet in case the Empire ever came back, but they never did. Zeb and Kallus went to Zeb’s home plane, which they had previously believed was devastated, to live a new life there. Hera and Rex continued fighting with the Rebellion in several battles, including Endor. And, somewhere along the way, Hera had a child: Jacen Syndulla, whose father was a certain departed Jedi named Kanan Jarrus. As for Ezra? No one has heard from him or Thrawn since the fight on Lothal. So now, with the Empire defeated, Sabine teams up with Ahsoka Tano—who, yes, is still alive after Return of the Jedi—to go and find Ezra. Hera is on a mission. Even just reading that I feel like need to catch my breath. The whole thing was such a bold move by executive producer Dave Filoni and his team. However, as powerful as the ending was, it was hard not to be a little taken aback by it. Since the show began, fans have constantly been asking where these characters would be during the original trilogy—why the two Jedi wouldn’t still be involved with the Rebellion, or why the Empire hadn’t summoned its greatest strategist, Thrawn, to help fight. And what happened to Ahsoka, the former apprentice of Anakin Skywalker? Well, the show provided answers, but only partial ones. That means, if you’re thinking about the Rebels finale only in terms of getting those answers, it’s a little frustrating to not have closure. So don’t think about it that way. These questions are not what Rebels is about. 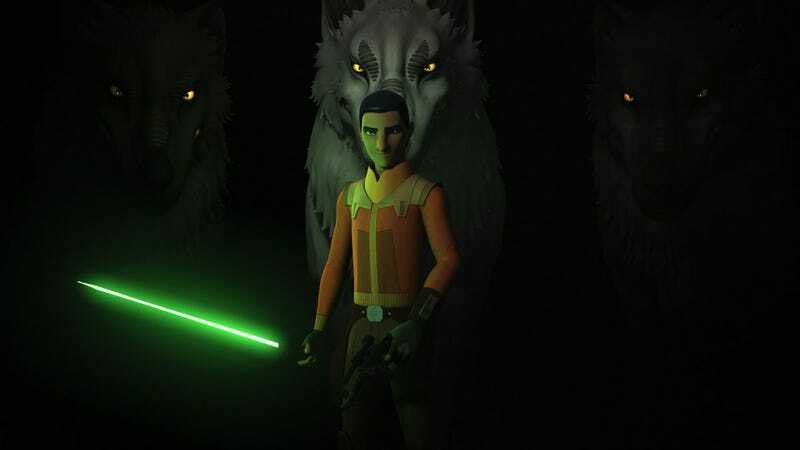 Rebels has been, and always was, about Ezra Bridger’s path toward becoming a Jedi—not the goal, but the journey itself, much like the original trilogy was about Luke’s path to becoming a Jedi. When you keep that in mind, these final episodes were exactly what Rebels needed. They were Ezra’s Return of the Jedi. The moment where Ezra Bridger fulfilled his destiny. We got to see this Jedi apprentice, without his master Kanan, hatch a multifaceted plan to liberate his homeworld. It was a strategic military triumph, with all kinds of layers, twists, and considerations for every possible outcome. Most importantly, though, Ezra not only gave himself up to Thrawn, when the Emperor put the thing he desired most in front of him—his dead family—he turned it down. That was the moment where Ezra Bridger, in a way, completed his training. It was his, “I’m a Jedi, like my father before me” moment. The first episode of Rebels in 2014 introduced us to a nobody kid quietly bugging the Empire on his home planet. Four years later, that same kid saved the entire planet. That’s quite a story, and its final chapter leads immediately to the opening page of the next book. We now know that Hera, Sabine, Zeb, and the others survived the events of the original trilogy; they even gained a new member in Hera’s son. This is a story that is just beginning with lots of things to consider. Does Hera and Kanan’s child have Force abilities? Where has Ahsoka been and how will her existence play into the timeline after Return of the Jedi? Where will she and Sabine go on their quest to find Ezra? Where are Thrawn and Ezra? Will that story end before the events of The Force Awakens? What impact will these characters have on the sequel trilogy? The questions are almost innumerable. However, those are questions for another time. The story of Star Wars Rebels ends here. Next, Ahsoka Tano and Sabine Wren will go off and find Ezra Bridger in the time between Return of the Jedi and The Force Awakens. Maybe that’s the next animated series from Filoni and crew, and maybe it isn’t. Either way, Rebels wrapped with a finale that was entertaining, emotional, and satisfying, all while leaving us hungry for more. That’s great Star Wars storytelling—which is exactly what Star Wars Rebels ended up being.